Shire, a company that develops innovative therapies for rare diseases, will be undergoing changes in its executive ranks. Recent test results from Shire's CUVITRU show the treatment has performed well in helping those whose immune system is not complete or do not work as it should. Biotechnology company Shire said it highlighted its research results on the unmet and changing needs of adults affected by attention-deficit/hyperactivity disorder (ADHD) at the annual meeting of the American Psychiatric Association (APA) held earlier this month in San Diego. Medication for a potentially lethal hereditary disease will undergo an accelerated FDA approval process likely to bring it quickly to market, according to a recent announcement from manufacturer Shire Plc. Shire recently launched "Rare Count" in honor of Rare Disease Day and the 350 million people worldwide living with rare diseases, which equates to nearly one in 20 global citizens. The global biotechnology company Shire Plc offered its latest insights into certain lysosomal diseases through presentations, satellite symposia and booths at the recent 13th annual WORLD Symposium in San Diego, the company said. Effective Jan. 3, 2017, Ian Clark officially started work Shire’s new non-executive director. 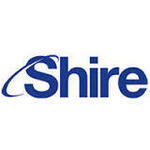 Shire, a company dedicated to providing treatments for rare diseases, neuroscience, gastrointestinal and internal medicine, has launched the Shire Future Generations program. After completing a request received last fall for more clinical studies and information about product quality, Ireland-based pharmaceutical company Shire has resubmitted a New Drug Application (NDA) to the U.S. Food and Drug Administration (FDA) for Lifitegrast, its dry eye therapy.